Shelby has just unveiled what they&apos;re calling their new base model, claiming it to be the "spiritual rebirth of the popular 2007-2008 Ford Shelby GT." Available to both V6 and V8 Mustangs, the Shelby GTS package upgrades include a Ford Racing handling pack, Baer brakes, Borla exhaust system, new front fascia, Le Mans stripes, and even a deep-draw hood. Optional features include superchargers for both engines, a Watts-link rear suspension system, two-tone leather interior, and 18 and 20-inch wheels and tire packages. Pricing starts at $9,995 for the package alone (buyers need to buy the base car first) and production is scheduled to begin in the last part of 2011. 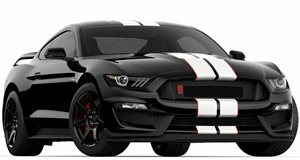 Considering the base V6 Mustang starts at just $22,145, it&apos;s now possible to own a Shelby Mustang for as little as $32,140.